The Elite Fish and Chip Company of Sleaford is celebrating once again after clinching two regional awards at the East Midlands Federation of Small Businesses Celebrating Small Business Awards 2019. 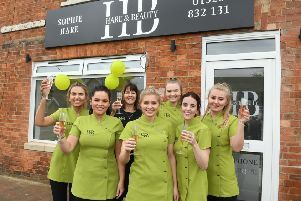 The chain which has outlets in Ruskington, Lincoln and Sleaford, scooped the Family Business of the Year award for the second year running as well as the Community Business of the Year award (area only). Rachel Tweedale, Co-Director at the chip shop chain, was thrilled to be named East Midlands Family Business of the Year for a second year in a row. She said: “Last year we celebrated our 30th anniversary year and as part of the celebrations we committed to a £30,000 fundraising campaign to be split equally between three charities which all have a close connection to the Elite. To have our fundraising efforts recognised with the Community Business of the Year Award is the icing on the cake for us. “We wouldn’t have won these awards without the hardwork and dedication of all our loyal staff,” she added. As regional winners of the Family Business of the Year, members of staff will head to the UK final on Thursday May 23 at Battersea Evolution, where the UK category winners and FSB Business of the Year 2019 will be announced.